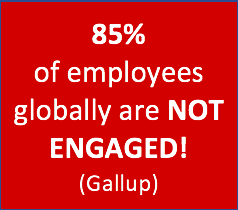 According to a recent Gallup State of the Global Workplace report, 85% of employees are not engaged or actively disengaged at work. The economic consequences of this global “norm” are approximately $7 trillion in lost productivity. …this global engagement pattern provides evidence that how performance is managed, and specifically how people are being developed, is misfiring. Most of modern business relies on annual reviews to provide feedback and evaluate performance. And yet the new workforce is looking for things like purpose, opportunities to develop, ongoing conversations, a coach rather than a boss, and a manager who leverages their strengths rather than obsessing over their weaknesses. They see work and life as interconnected, and they want their job to be a part of their identity. See Jim Harter, Phd, Gallup: ‘Dismal Employee Engagement is a Sign of Global Mismanagement‘ and thanks to Compuware CEO Christopher O’Malley for highlighting the statistics of disengagement in a recent LinkedIn post. If harmonized, these desires are central for a thriving organization. How can the interests of the community (organization) and the individual (employee) all be fulfilled and served? As Dr. W. Edwards Deming repeatedly pointed out, an individual’s performance within an organization is the result of what the individual is capable of PLUS all the interactions and interdependencies in which they are immersed. As a result of these interactions, Dr. Deming rightly claims that assessing individual performances in an organization is both dangerous and useless. An organization is different from a group of people waiting for a bus not because they do not have a common goal, they do, but because an organization ties the individuals and their actions within a network of interdependencies. These ties have the power to multiply the outcome of these actions or, sadly, debase it. These ties, in creating a unique way in which individuals interact, give origin to an entity, “the organization.” Organizations develop “corporate culture” and the job of HR seems to have become the development of appropriate metrics. These metrics are almost invariably psycho-statistical approximations that, very often, stifle innovation and beef up controlling syndromes. All of this leads to a lack of engagement. Imperfect individuals are the elements of a continuously-improving-to-be-perfect community. The most perfect community is made up of individuals exercising their individuality, developing their unique potential, and at the same time, the only way an individual can truly actualize their potential is through belonging to a healthy community. This is a place where meaningful work can be done. Does this sound too idealistic? Fortunately, there is an alternative. There is a way out of the blind alley of organizational divisiveness that stems from the artificial silos that plague so many companies. It starts with understanding, as Deming taught us decades ago, that organizations are whole systems. Organizational design only makes sense when it concentrates on creating the best, easiest and smoothest way to allow competencies to interact. Interact for what? To achieve a common goal; invariably, this goal is connected with satisfying the Market. Only when we truly understand what an organization is can we design one. Organizational design, then, is the science, not the magic, of enabling different competencies to achieve the goals for which they have been brought together. The knowledge, method and tools to create organizations that can foster quality, involvement, and flow in line with our legitimate ambition for meaningful work already exist. They are at the heart of our work and have been for over two decades. They are embedded in our methodology and the ‘Network of Projects‘ organization design that has resulted from dozens of implementations. The time has come for organizations to wake up to the absolute urgency of engaging their workforce towards a common goal. As a society, as organizations and as individuals, we cannot afford to keep wasting our potential. Intelligent Management, founded by Dr. Domenico Lepore, are trusted advisors to leaders of organizations with their unique, systemic Network of Projects organization design. We blog about how to shift your thinking towards broader, systemic possibilities for yourself and your organization. Sign up to our blog here. Intelligent Management provides education and training on systemic management, W. Edwards Deming’s management philosophy and the Theory of Constraints (Decalogue methodology) in North America and Europe.